"I hate the term 'plus-size', it makes me feel like I've won something." In the time that I've had Queen Sized at home, every friend and relative that's been over my place has called it into question. I suppose it sticks out like a sore thumb in a "to-watch" pile currently littered with sleazy European horror and exploitation films, but it's not like my tastes aren't varied. I like a good chick flick as much as anyone else (except when Matthew McConaughey is involved—if I ever meet him I will insist on a refund for Failure to Launch), but I wasn't exactly thrilled to add Queen Sized to my collection. Why not? One word: Lifetime. That's right: Queen Sized is a Lifetime original film, a distinction likely to carry an "avoid it like the plague" stigma for some while arousing interest in others. It's my first foray into the world of Lifetime cinema and, if the quality of Queen Sized is any indication, will likely be my last. Now before anyone can accuse me of bias let me say this: I try and evaluate every film I watch on its own merits. There's just no other way a man could love Friday the 13th, part VI: Jason Lives (which simply DID NOT get a fair shake on this site) and Terms of Endearment equally. 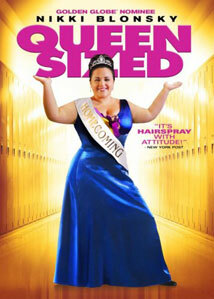 So when it came time to watch Queen Sized, the story of an overweight high schooler, Maggie (Nikki Blonsky), nominated for homecoming queen by her elitist peers, I thought it could be an enjoyable little moral comedy. It's not, though, and it's not hard to see why. It tries to manipulate the viewer into getting behind Maggie by illustrating the adversity she faces on a daily basis. Her mother makes no bones about commenting on her weight and she's a constant victim of torment at school (mainly its members of the football team who make pig noises when she walks by). It's not uncommon to showcase the adversity our underdog is faced with in films like this. The problem, however, is that it never bothers to make us care about Maggie as a person. Instead, the script wants us to care simply because of the way she's treated. Sure, but give me something more. Blonsky tries to imbue Maggie with some humanity but cannot overcome the paper thin characterization. Each time she's bullied her character sulks off in tears to gorge herself on ice cream and cake. I'm sure that the filmmakers wanted to illustrate the vicious circle of obesity, at least to some degree. But it quickly becomes repetitive, particularly when the film can't be bothered to give us any additional insight into her character. We know that she's overweight, and that she wishes she wasn't. Beyond that there's nothing to identify with or hold onto. Viewers able to identify with Maggie may also tire of her brooding behavior, since she comes off like a big baby. I don't mean to be unsympathetic here, but in an underdog story you've got to show the main character's inner strength that makes the inevitable triumph possible. Superfluous writing like this is typically reserved for the worst Lifetime movies. I know, cheap shot. Especially after admitting this was my first one. But it's true. In a film with such a nonexistent main character, it should come as no surprise, then, that the secondary characters are even more one-dimensional. The "villains" are even more superficial than the Plastics of Mean Girls, only this isn't a satire. It's the true story of a teenager that turns a cruel joke on its ear against all odds, and it's been thoroughly trivialized. I'm not going to dispute this film's good intentions, but I can't overlook the sloppy filmmaking, either. Image Transfer Review: Anchor Bay. For a time you were the absolute best out there, at least from a horror fan's perspective. I used to buy any genre title they put out, as you could almost always count on a top notch sound and video presentation. But they've since been absorbed by Starz Media and their output has been considerably less interesting. Enter Queen Sized. The good news, though, is that they've sacrificed none of their cosmetic integrity in the dramatic shift in content. It's a good-looking image. Very crisp and detailed. Colors are vibrant and the blacks are devoid of any crush. The film is fairly colorful and the image captured on this disc looks very good. Audio Transfer Review: And again, true to from, Anchor Bay offers a lively 5.1 Dolby track to keep your home theater working. This is a musically-heavy film (with one terrible Duncan Shiek cover showing up at least three damn times) that exercises the subwoofer and rear speakers often. Dialogue is occasionally lost in the shuffle becoming muffled, though never inaudible. Overall you get a surprisingly stable tack for such a throwaway title. A lousy movie. Tedious and forgettable, I'd have a hard time recommending this to its target audience, let alone the digitallyObsessed. Proceed with a rental only if you're hard up for the most depthless of dramadies.